Network Attacks and Exploitation provides a clear, comprehensive roadmap for developing a complete offensive and defensive strategy to engage in or thwart hacking and computer espionage. Written by an expert in both government and corporate vulnerability and security operations, this guide helps you understand the principles of the space and look beyond the individual technologies of the moment to develop durable comprehensive solutions. Numerous real-world examples illustrate the offensive and defensive concepts at work, including Conficker, Stuxnet, the Target compromise, and more. You will find clear guidance toward strategy, tools, and implementation, with practical advice on blocking systematic computer espionage and the theft of information from governments, companies, and individuals. Assaults and manipulation of computer networks are rampant around the world. One of the biggest challenges is fitting the ever-increasing amount of information into a whole plan or framework to develop the right strategies to thwart these attacks. This book clears the confusion by outlining the approaches that work, the tools that work, and resources needed to apply them. Governments, criminals, companies, and individuals are all operating in a world without boundaries, where the laws, customs, and norms previously established over centuries are only beginning to take shape. Meanwhile computer espionage continues to grow in both frequency and impact. This book will help you mount a robust offense or a strategically sound defense against attacks and exploitation. 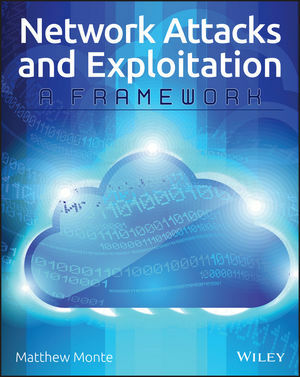 For a clear roadmap to better network security, Network Attacks and Exploitation is your complete and practical guide. MATTHEW MONTE is a security expert with 15 years experience developing computer security tools and strategies for corporations and the U.S. government. His career includes technical and leadership positions in industry and the U.S. intelligence community. He holds a Master of Engineering in Computer Science degree from Cornell University.